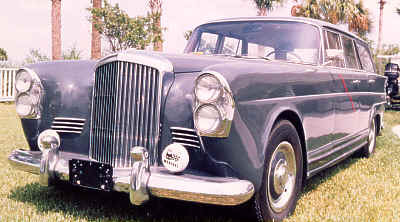 The majority of all Rolls-Royce and Bentley motor cars from the sixties sported standard coachwork ex factory. 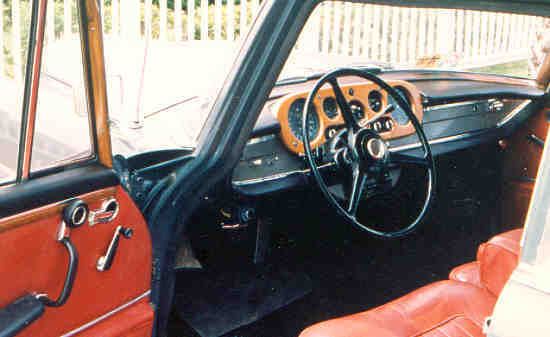 Coachbuilt motor cars were of somewhat special status, usually representing highlights of coachbuilder's art as regards design and craftmanship. Even when contemplating that beauty is much in the eye of the beholder there cannot be much doubt that a Bentley S2 with shooting brake body to a Mercedes-Benz design will rarely ever be awarded a trophy during a Concours d'Elegance. However the story of this motor car is as unique as its appearance and the order for this car being placed with the German coachbuilder Wendler of Reutlingen for the owner was but consequently following a tradition. As regards the 1960 Bentley S2, #LLBA9, but very few documents do exist at Wendler's and a few more are part of the Rolls-Royce files now in the custody of the RREC. The client's name again didn't appear. Instead his agent E.E. Endt ordered from the New York dealer J.S. Inskip a Bentley S2 chassis with long wheelbase and left hand drive to be delivered to Wendler of Reutlingen. 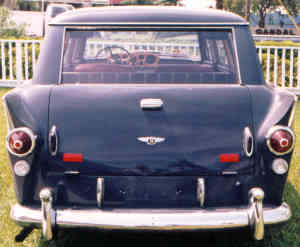 Of 57 lwb Bentley S2 there were but 6 fitted with bodies by independent coachbuilders - and this one was the only lhd example. Erhard Wendler had started coachbuilding in Reutlingen in 1840. The business remained in the family which only after the Great War decided to start building bodies for motor cars. The company satisfied their customers' demands. Their products were including lorries and cattle transporters and coachwork of finest quality on such renowned chassis as Benz, Maybach - and one Bentley 3 Litre. An outstanding product being an armoured Cadillac to the order of H.M. The King Ibn Saud. The order for the Bentley S2 was detailed asking for white wall tyres by Firestone, "Made in England" origin sign, big dimensioned brake pedal, specially loud horns and several minor extras. Because a special type of headlamps was asked for and the headlamps usually were integrated into the front wings, Rolls-Royce added a wooden crate containing two front wings complete with headlamps, when the car was shipped to the continent. Despite the very unusual appearance it cannot be denied though that this special motor car at that time amalgamated the finest from both worlds: the solid chassis of the Bentley S2 with its enormous strength and the new powerful V8-engine were united with a body and an interior by the then finest German coachbuilder. It is somewhat strange but true that any Mercedes-Benz aficionado as well as any Bentley enthusiast feels immediately well at home once behind the steering wheel of this automobile. A fine advantage is that the rear light can be lowered into the back door and an almost staggering amount of space is offered when the rear seats are folded flat. Wendler had dealt with the problem of the coachwork being originally of monocoque construction by welding in a lot of strengthening devices. This resulted in the coachwork becoming rather heavy which didn't bother the owner. The engine with its 6,230 ccm capacity delivered more than sufficient power. The Bentley was tested extensively registered with German oval custom's plates reading 254 Z-609 before she crossed the Atlantic ocean. Then she was used for some time in Virginia/USA, though it was registered in the name of someone who gave as his address the New York Yacht Club. After the demise of the gentleman who had fulfilled his wish for dream car in such a special way the car was given to an American museum - again no name mentioned with the executor's explanation that this was due to the owner's last will's instructions. Some time later the car was sold again and then used in Europe for several years - maintenance bills and ferry tickets were sent to a Paris address. The mileage had not exceeded 37.000 miles when the Bentley S2 became the property of collector in Florida - who happened to own the mate too, the still existing Mercedes-Benz 300 S bodied by Wendler for the same client. The new owner was keen to collect as much information as regards this unique pair of motor cars as possible. He felt rather sure even to be able to find out the name of the original owner because both cars showed stripes in red and blue applied to their front doors. Alas, these were not matching to any of the race colours which ever had been found on yachts of members of the New York Yacht Club. Almost unbelievable was the information that in the late Eighties both cars were owned by a collector in New York again! With the exception of hints as regards the original owner of the car (which are not verified) there remains but to resume that a well-heeled eccentric has been in position to fulfill his wishes for a dream-car: a Bentley-based Mercedes-Benz. All photos courtesy of deWayne G. Richey, III, U.S.A.